Use railroad ties horizontally. Railroad ties have been popular for building steps and raised beds for a while, but you also can use them around the perimeter of your yard to create an edge for your borders. Here, two straight runs sit opposite each other, with smaller, more interesting beds at the end. Home improvement stores stock railroad ties. Whether you go for new or reclaimed ties, make sure you buy untreated ones since the chemicals can damage your plants. New planting design. 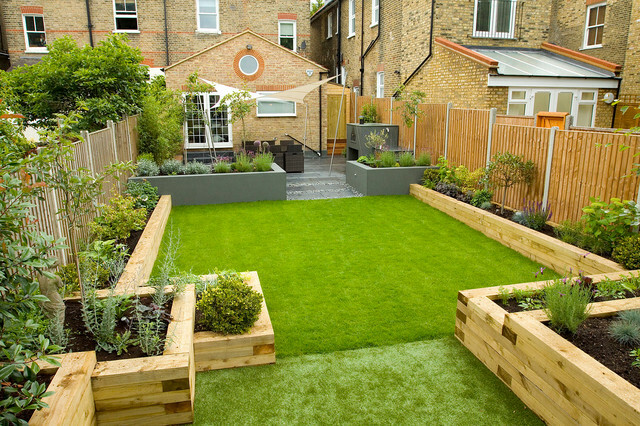 Melissa Morton Garden Design.